A unique activity for people interested in graffiti, murals, photography and in-rotation exhibitions through uncommon and unknown spots. Madrid has a cool urban art scene. Travel back in time with Cooltourspain to the beginning of the graffiti movement and learn how it began to develop. You will start your tour with an explanation of the history, techniques and theartists who belong to this underground movement., Enjoy a visit to the walls of La Tabacalera, one of the most famous warehouses in Madrid. The tour will take you around Lavapiés neighborhood, one of the most multicultural neighborhoods in town. You will discover it through its political and social street art. There are several graffiti festivals visited such as CALLE Lavapies, Muros Tabacalera or Urvanity art, which feature the artwork of Okudart, Ben Eine, Blu or El Rey de la Ruina. Meeting at 11.00AM by theTwo big babies statues @ Atocha Renfe Station, just across hotel Only You Atocha. First of all, we will visit La Neomudéjar, located behind Atocha Railway statio. It is the kick-off point of this visit and 5 minutes walking from the two big babies statues monument in Atocha. It once hosted the former Mediodía metro station, and is home of the avant-garde center of Madrid. There are different artists on rotation and counts with innumerable photographs and picture exhibitions. Participants of this tour will visit the most valuable part of La Neomudéjar, the fuel generator kept intact since 1800s which powered Atocha railway station for centuries. Ze Carrión, Laguna626, Himen and many more national and international artists have participated on the creation of an extraordinary independent center. All of them with a common performer profile: guerrilla fighters (disagreeing with the law article 626 that penalizes the performance of graffiti), voracious and urban, with a desire of representing through art their worries and interests. The second surprise will arrive after your guided visit at La Neomudejar. La Tabacalera is a warehouse in which more than 1,000 women worked on the shredding, chopping, and rolling tobacco labors in the XIX century. This second spot to discover is a self managed public space in which people can attend painting, singing or dancing workshops any day of the week, but also walk along the underground basement covered with hundreds of graffiti and stencils. Murals will come alive into action with several explanations about the works displayed by Sabek, Okudart or JM Yes. Urban Natures is the actual performance of the walls and it talks about the connection between nature and cities. 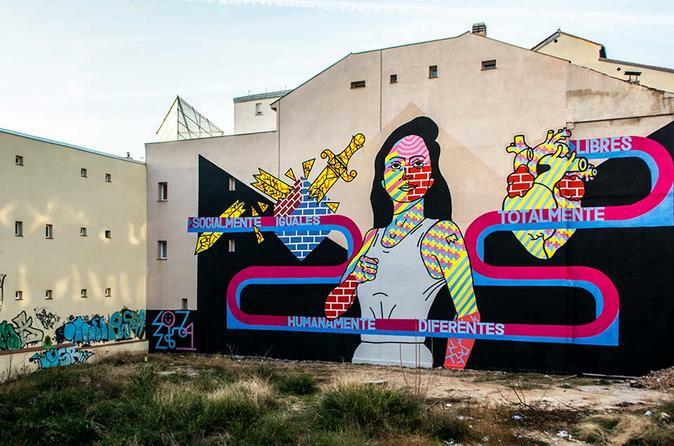 Toni Arribas, who created a 400 square meters painting, tries to emphasize on women´s rights. His performance will be the third spot visited. A performance about women's values and the break of a patriarchal society. It includes a quote from Rose of Luxembourg. The Barley’s field, aka Campo de Cebada, is located right next to the market with the same name in La Latina square. It is our last spot visited. The importance of this point is closely related to the 15M movement, by which people felt the necessity of taking over the streets and public open areas. It was once the setting of a public swimming pool, but due to the poor public & private organization/ investment, local associations took the leadership role and created a common space where people watch movies at a summer cinema, listen to music at the different events that have been organized all year long, or simply plant their own vegetables in the garden that was created in 2010.